I'm jan Same, I've started learning toki pona a few weeks ago after reading an article about a group of persons learning it in two days. I love learning languages so I took the challenge. Well two days wasn't enough but I liked the community and how toki pona sounded so I continued. One thing I love, is creating scripts for conlangs. And I really love Jonathan Gabel's sitelen sitelen. 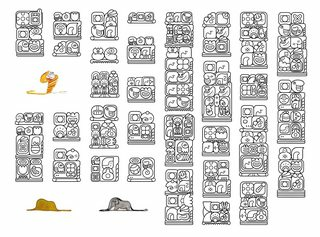 So I decided to "vectorize" all the sitelen sitelen glyphs to help me learn. It's the first chapter of "The Little Prince", I used Michael F's translation. Use them as you wish! Be creative! Have fun! Use them for the greater good! Another reason I did this was to create a font. But I don't know how to program such a thing. I hope that somebody with programming knowledge will be able to create one using these graphics. If you're out there, toki pona needs you! So there you have it, my little contribution to the world of toki pona. Tell me what you think. ni li pona ala pona? sitelen sitelen li pona mute. sina pana e pona tawa jan ali! I left the project in its infancy, mainly because of a lack of motivation to create all the vector glyphs myself and second I didn't have a nice set of example sentences to test my algorithm on. You, my friend, have now given me both: vector glyphs (prettier than mine) and a nice chapter of sentences to play with. I think I will reboot my project once again!! Thanks! BTW I also started on a kind of mindfulness/toki pona learning app that not only uses sitelen sitelen for text but also uses the word glyphs instead of standard UI icons such as 'back', 'save',' share', 'ok', 'cancel'. After all, a full set of icons can also be seen as a minimal language. jan Olae wrote: BTW I also started on a kind of mindfulness/toki pona learning app that not only uses sitelen sitelen for text but also uses the word glyphs instead of standard UI icons such as 'back', 'save',' share', 'ok', 'cancel'. After all, a full set of icons can also be seen as a minimal language. pali sina li pona tawa mi. Is it possible to use your apps on other operating systems? I've made a new version of the files. I also realised that the EPS files had a few problems. In this new version I've updated the files to include “Advanced_EPS” files for newer vector programs and “Low_EPS” for older programs. Of course, the .Ai files remain. Thanks for creating this. I think it is very awesome. Having individual SVG files allows for embedding the glyphs in web pages and using the glyphs in a multitude of ways.